Backlit 10 character LCD on remote as well as backlit LCD and control buttons on body. Large style jog dial for inputting disc and track titles (up to 50 characters). High speed (2x) playback mode for mono or stereo recordings with no pitch change. Title search function allows another track to be selected by name while unit is playing. Divide function has rehearsal mode (as MD decks do) that repeatedly plays 3 second segment at divide point, allowing divide point to be moved with AMS knob or << and >> keys (edit point step size is 60ms). Synchro start recording from digital and analog sources. Repeat 1, all, shuffle and 25 track program play mode. 40 second shock memory, sampling rate converter. Date and time stamp recording. Time mark function can automatically make a track mark every 5 minutes. 3 step battery life indicator on main body as well as remote. Included accessories: LCD remote, stereo headphone, one point microphone, AC adapter (AC-D401 [AC-D401U in US]), LiIon cell, Dry cell case (for AAx3), Carrying pouch, Neck strap. US, UK (& European?) units omit neck strap and one point microphone, US units replace earbuds with 'swoops' (HP-M038), which are behind-the-head street-style headphones. Variants: The Aiwa AM-F65 has been released in Europe, it is nearly identical to the AM-F70 but has no backlight on the main unit's LCD panel, has no LCD panel on remote, and comes without dry cell case (for AAx3). Battery substitution: Ricard Wanderlof has a page describing a battery substitute that can be used to keep your Aiwa running even though the original batteries are no longer available. Aiwa's Japanese announcement of the unit. Rob Nguyen's comprehensive review of this unit plus his extensive comparison of the Sharp MD-MT821, Sony MZ-R55, and Aiwa AM-F70. 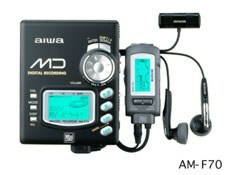 Japan Direct has some clear snapshots of the Aiwa AM-F70, including one of it beside an MZ-R55. 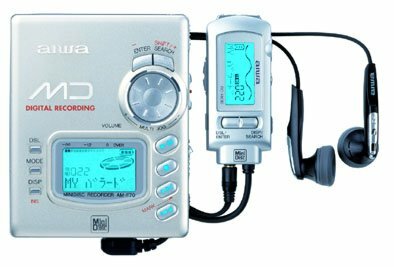 An Aiwa AM-F70 review at MiniDisc World. Heiko Debschitz notes photos and German pages for Aiwa's AM-F65/70 series in silver, blue, green and champagne. Bruce Mcmahan submits a detailed review of the Aiwa AM-F70. eTown has a review for this unit. Minidisco has a rotatable 3-D spinning image of this unit. The Aiwa AM-F70 is spotted for $200 at Tweeter (search for "amf70"). Simon Wilson has made a handsome comparison report of the Aiwa AM-F70 and Sony MZ-R90.